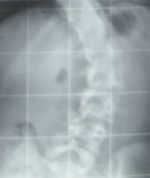 X-ray of scoliosis is generally the choice for both initial evaluation and follow-up. Moderate thoracic levoscoliosis with a Cobb angle of 40° between Th6 and L1, and a mild lumbar dextroscoliosis of 17° between L2 and L5. Categorization into dextroscoliosis (convex towards the patient's right) or levoscoliosis (towards left). Typically, there is a main curvature, with secondary counter-curvatures above and below it, which should be measured as well in more severe scoliosis, or if it is not clear what is the main curvature. Cobb angle measurement of the anticipated greatest angle seen. angle formed between a line drawn parallel to the superior endplate of one vertebra above the fracture and a line drawn parallel to the inferior endplate of the vertebra one level below the fracture. Optionally: Coronal balance, which is the horizontal distance between the middle of the vertebral body of C7 and the midline of the sacrum. It is significant if measuring over 2 cm. Dextro- and/or levoscoliosis, or "mild dextro-/levoconvexity but no scoliosis"
Cobb angle in numbers, and between which levels, if the referral has any focus on the scoliosis, otherwise a severity grading is enough. ↑ Page 89 in: Dr. Kevin Lau. The Complete Scoliosis Surgery Handbook for Patients: An In-Depth and Unbiased Look Into What to Expect Before and During Scoliosis Surgery . Health In Your Hands. ISBN 9789810785925. ↑ 2.0 2.1 Page 460 in: Konrad E. Bloch, Thomas Brack, Anita K. Simonds (2015). ERS Handbook: Self-Assessment in Respiratory Medicine . European Respiratory Society. ISBN 9781849840781. ↑ Yuranga Weerakkody and A.Prof Frank Gaillard. Coronal balance. Radiopaedia. Retrieved on 2019-01-16. This page was last edited on 16 April 2019, at 15:20.